Heat oven to 450°F. Bake pie crust as directed on box for One-Crust Baked Shell, using 9-inch pie plate. In medium bowl, microwave whipping cream uncovered on High 30 seconds. Stir in chocolate chips and vanilla until smooth. Spread chocolate filling over bottom of baked shell. Refrigerate 30 minutes. In large bowl, beat cream cheese, butter, almond butter and powdered sugar with electric mixer on medium speed until smooth and fluffy. Carefully spread over chocolate filling. Spread whipped topping over almond butter filling. 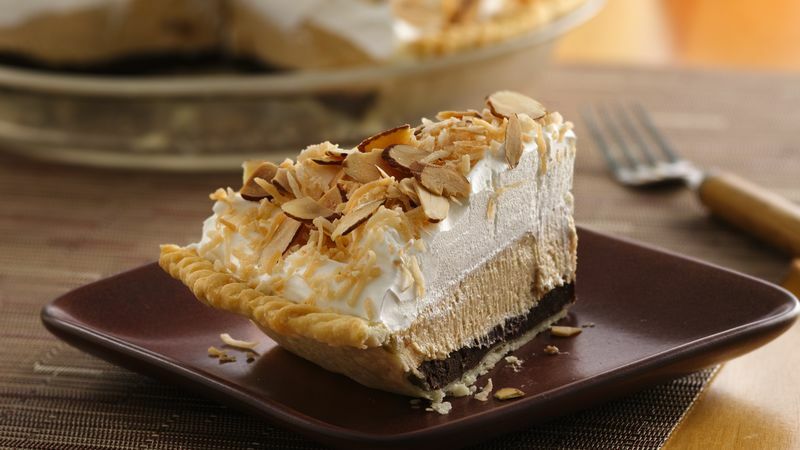 Mix toasted coconut and toasted almonds. Sprinkle over whipped topping. Refrigerate about 2 hours or until set. Cover and refrigerate any remaining pie. Coconut can be toasted 5 to 7 minutes on ungreased small cookie sheet while oven preheats. Then almonds can be toasted 8 to 10 minutes on same cookie sheet after removing coconut.